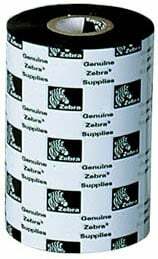 The Zebra 5555 Enhanced Wax-Resin is a thermal transfer wax-resin ink formulation for printing barcodes on Zebra coated paper. Provides a clear image under harsh conditions. Prints at speeds up to 6 ips. The Zebra 05555BK08345 is also known as ZEB-05555BK08345-C	.